The dental problem of teeth-grinding in sleep affects about eight percent of adults, according to the National Sleep Foundation. Termed sleep bruxism, it is even more common in children. Over time, it can lead to a problem referred to as TMJ—which can make chewing painful. Damage to teeth in children can cause cracks resulting in loss of enamel and bone, as well as sleep disturbances. The alignment of the upper and lower jaw can be displaced in individuals who grind their teeth. This can result in TMJ—a joint disorder in which the mandible is pushed back toward the ears on swallowing. The symptoms include facial pain, difficulty in opening the mouth to usual width, and headache. Chewing a crunchy food item can be extremely difficult for people who suffer from TMJ. Stress is considered a major cause of both teeth-grinding in sleep and TMJ. Additionally, TMJ is also caused by malocclusion of the jaw due to injury, structural defects, and other factors. In children, teeth-grinding in sleep may be a response to pain (such as an earache or tooth eruption). Some pharmaceutical agents also contribute to sleep bruxism, and it is also associated with hyperactivity disorder and cerebral palsy. 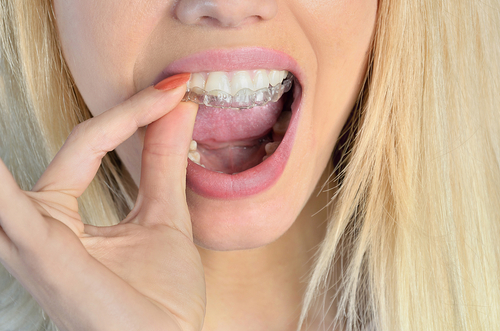 Treatment may include wearing a mouth guard or bite plate at night. However, if stress is the causal factor, practicing relaxation techniques before bedtime may eliminate the teeth-grinding. This can include meditation, spending 15 minutes performing tai chi poses, or simply focusing on pleasant memories before retiring for the night. Meditation should not be performed immediately before going to sleep for the night due to its energizing potential (per an article Psychology Today in 2012). However, a 15 minute meditation an hour before bedtime can calm anxious thoughts and increase relaxation. Drinking a high daily amount of caffeine and cigarette-smoking have also been suggested as causal agents of sleep teeth-grinding. Reducing caffeinated beverage intake and smoking cessation is recommended to ascertain if either are related factors on an individual basis. If lowering or ceasing consumption of caffeine and nicotine results in no further sleep bruxism, the treatment course for that individual is obvious. On the other hand, if it does not result in elimination of sleep bruxism, reducing caffeine and nicotine exposure is still a good idea for other health reasons. Some pharmaceutical agents have been linked to sleep teeth-grinding. Amphetamines and SSRIs are two such classes of drugs (as described in an article in 2013 in Annals of Rehabilitative Medicine). Amphetamine abuse is particularly a cause of sleep bruxism, so severe sleep teeth-grinding combined with a history of amphetamine use and poor oral hygiene may be an indication of amphetamine drug abuse. Uninterrupted sleep—enabling REM sleep and dreaming—is important for maintaining health. Lack of quality sleep can negatively impact the immune system, and increase the likelihood of viral and bacterial infections. Poor sleep quality can also cause decrease reaction-time behind the wheel of a car, truck, or bus (and cause accidents). Therefore, promotion of adequate sleep by healthcare practitioners can increase public safety as well as health.